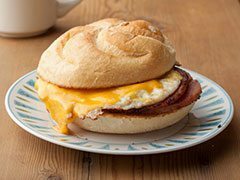 One of New Jersey’s most famous foods, the Pork Roll sand­wich is made from John Taylor’s Pork Roll, first made in 1856. It’s a lot like SPAM, but dif­fer­ent, but to make this recipe, if you can’t find Tay­lor Pork Roll, you can cut SPAM very thin­ly and use it instead. Score the edges of the pork roll slices in 3 or 4 places. This will keep the slices flat and pre­vent them from buck­ling as they cook. Heat the but­ter in a large non­stick skil­let over medi­um-high heat. Add the pork slices in one lay­er and brown well on both sides, about 6 min­utes. Remove the slices and place one on top of each toast­ed roll bot­tom. Reduce the heat to medi­um-low and crack the eggs into the skil­let. Break each yolk with the cor­ner of your spat­u­la. Sprin­kle with salt and pep­per. After about 2 min­utes, flip the eggs and con­tin­ue cook­ing on the oth­er side. Imme­di­ate­ly place a slice of Amer­i­can cheese on top of each egg. Cov­er with a lid to melt the cheese, about 30 sec­onds. Place each egg and cheese quad­rant on top of a browned pork roll slice. At this point you can squeeze ketchup on top if desired. Top with the oth­er half of the roll.